Quoted from a renter " This property has a million dollar view!" This is quite simply one of the best views on the CT river. Take in the panoramic view of the river daily and watch the sun setting on the spacious deck at night while you enjoy the gas fire pit. This home is rented every year by the PGA Golfers during the Travelers open! Additional information, photos and DISCOUNTS can be found on the web at Lobstertooth com. Level 1 features three bedrooms, 2 rooms with queen beds, 1 room with a bunk bed all with a view of the river. The full bath has double sinks with granite counter tops and a shower/tub. There is also a lower living room with 43' LCD TV with a couch & games to sit & relax. Level 2- Overlooking the river the main floor features laundry room, half bath, breakfast nook, gourmet kitchen with stainless touch appliances. The kitchen is fully stocked w/ pots, pans, utensils, almost everything you would need for cooking. The living room has a 60' TV w/ 7 channel surround sound, leather couch & love seat. The dining room has a large cherry table with seating for 6-8. Step outside to the huge deck to enjoy panoramic views and spectacular sunsets. The deck features an outside 32' LCD TV, outside speakers, couch & lounge chairs with over stuffed cushions, large eight person dining table, propane fire-pit with seating for eight, grill, and a air-chair swing and hammock underneath. Need some piece and quite but still want to have fun? This property is completely private. The 1/4 mile driveway takes you away from any noise leading you to complete privacy & solitude. No neighbors to be seen or heard from including across river. The sounds you would hear would consist of birds, (including a Bald Eagle nesting across the river) and boats traveling the river. Private beach on the river! 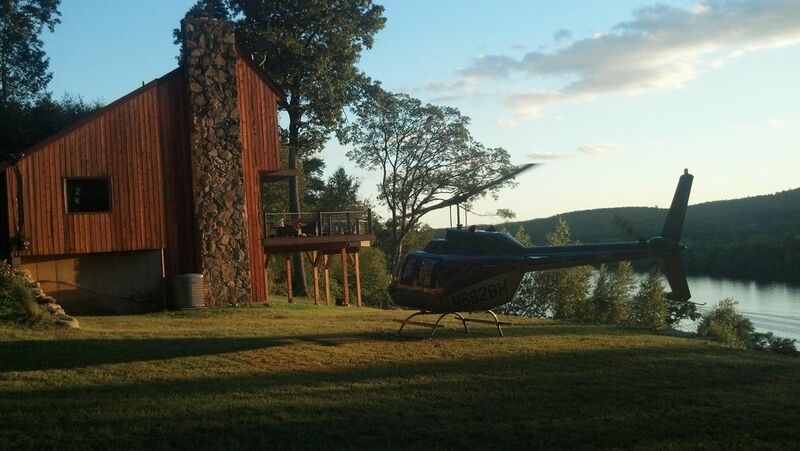 **The property has a helipad. Helicopters approach from South East (river side) land left of the house. A windsock is located on the roof. Bring your boat! We installed a boat mooring so you can leave your boat in front of the beach during your stay. We can accommodate up to a 50' boat. This is a No Smoking house, minimum age of 30 required to rent/sign rental agreement & sorry no events. This property I purchased for a house flip. A few weeks into this project I fell in love with it and knew I couldn't sell it. So I spent the next 8 months ripping apart the entire house, redesigning the layout, moving walls, replacing all plumbing & electrical adding state of the art AC & Heating systems. I put this house together the way I wanted, using only the best materials. I personally designed & installed all the tile, marble, kitchen cabinets, windows/doors, outside deck, everything down to picking the paint colors. The house came out fantastic and it is here for you to enjoy. 8 out of 10 people said the pictures don't do it justice. Unique benefits this home has to offer... 1) A heliport. Fly in if you wish or have a helicopter come take you for a ride. 2) Privacy. No neighbors, not even across the river. Complete solitude & only a 5 minute ride to shopping, gas & restaurants. 3) Unbelievable panoramic views. You can sit on the deck and watch the sun set directly over the other side of the river. After that gather around the fire pit on the deck. 4) The beach. Take a walk down the staircase to the river. Here I have a rowboat, canoe, 7' float island, fire pit, picnic table, chairs, propane grill for you to use. 5) You can bring your own boat to use on the river during your stay. Enjoy! All bathrooms are completely redone. Double sinks with granite counters in the upper & lower bathrooms. The master shower is custom made featuring five shower heads, 4 horizontal body sprays and a rain shower head. Satellite on all TV's except the Google TV, this has a HD antenna which picks up local HD stations. This house is absolutely stunning! From the minute we walked in the door and saw the open floor plan, we were in love. The deck is spectacular, and we were able to watch a beautiful sunset over the Connecticut River. The master bedroom is fabulous because it was almost as though it was a private area for me and my husband. The bedrooms downstairs were perfect for the kids, too! They had so much fun playing and watching movies on the day it was rainy, but most of all, they couldn't get enough of being down at the river when the weather was sunny and (relatively) warm. At night, they were so excited to sleep in the bunk beds. It worked out so perfectly that they had their own bathroom, too! Thank you so much, Dean, for being an incredible host and wealth of information about the area. We will be back! Highly recommend this property. The home is absolutely beautiful and the views are incredible. Very spacious with more than enough room for any activity. Really is an impressive home. Will be staying here again! We absolutely loved our 3rd stay at this riverfront home! First, it's very remote, you don't have to worry about your neighbors at this location. The view is amazing. Really amazing. There's access to the river and a private beach down a long set of stairs (it's picturesque). The deck off the back is fantastic, spacious, and beautifully done. Perfect for relaxing or entertaining. We honestly never feel a need to leave the house when staying here. The house itself is very nice, updated, and tastefully modern, yet still a little rustic as a house of this type should be. There's plenty of room for several couples or even families. The lower lever has multiple rooms, all well appointed and clean. The main floor is more for entertaining and/or relaxing. Upstairs there's a beautiful master bedroom. The bathrooms and kitchen have always been clean when we've stayed there. Speaking of the kitchen, it too is extremely nice and has everything you'd need. It's large and modern, plus right off the gorgeous deck. Everything overlooks the river and countryside. The house in general is well appointed. Basically bring the cloths, beverages, and the food you think you'll need for the week, and there's little reason to leave this beautiful location! I should also note the rare time or two I had a question or minor issue, Dean (the owner) was extremely responsive and available at all times. He also has no issue with us bringing our own boat or even having a friend bring his helicopter and leaving it there for the week! I can't say I've had many homeowners this accommodating in the past when renting houses! Overall I can't imagine anyone being disappointed with staying here! The pictures are all accurate, as is the owner's description. It's a five star location, house, and value at that. We are already looking forward to our next stay here! Great location and beautiful views. Plenty of space. Negative - the place smelled very musty during our stay. We tried to air it out - that helped a little. But, still a musty smell. We slept 6 adults and three children no problem. Plenty of beds and baths. We entertained visiting family members on the unbelievably scenic deck. Big functional kitchen and super family room made it ideal to have everyone over. We’d stay again. Celebrating my husband's 60th birthday, this was the perfect location for our family to get together. The house is very clean and modern. The large deck overlooks the water and the magnificent sunsets. My family members enjoyed the kayak, canoe, and fishing, and we all enjoyed relaxing by the the gas fire pit. As stated in other reviews, there is a steep walk down to the water. Take it slow, and you'll be fine. The backyard is also steep, so suggest that young kids play in the side yard where it is more level. There is a bonus room next to the master bedroom on the upper level. We put our grandson's pack and play in this room....A pull out couch or another bed in this room would also be useful. Note: There is a crib in the basement, but it wasn't assembled. Suggest bringing a bassinet or pack and play for young children. As stated in another review, the basement level smelled musty the first day, so we opened up windows to air it out. A/C is on the first and second floors only. We had great weather so we went apple picking, went to a brewery, and went on a river cruise. If you are looking for peace and quiet with great views, look no further. New to the rental market in 2011. This property is located just 3 minutes or 2.5 miles from Saint Clements Castle. Going South is a short 8 minute drive which brings you to a beautiful historic district on the river in East Haddam where the Historic Goodspeed Opera house is located. Here live theater takes place all summer long. Next store is the Gelston House, enjoy fine dining on the river or just sit back and relax at La Vita Gustosa's Italian restaurant. North 10 minutes brings you to Middletown for shopping, restaurants and cinema. West 5 minutes brings you to East Hampton. Here there is a lake, restaurants, 24 hr. Citgo and Stop n Shop. A little further drive East (aprox. 20-30 min) will bring you to Mystic Aquarium, Foxwoods & Mogehan Sun Casino. Rates are based on 9 guests; add $50 per additional guest per night. No more than 10 people staying overnight.